A plot to get compensation for a death unraveled in China’s Hubei province. A Chinese street vendor in the city of Wuhan, capital of Hubei province, tried to pull a fast one on authorities by faking his own death while his accomplices demanded compensation. The plot was foiled, however, when the man, identified only by his surname Han, jumped up and tried to sneak a bottle of water. He simply couldn’t take the heat. “It’s too hot. I can’t bear it anymore,” he was quoted as saying by Xinhua. Photos of a Han guzzling water can be seen here. He wasn’t exaggerating. The heat in Chinese has been pushing thermometer readings off the chart this summer. Han faked his death at the hands of China’s chengguan, an unarmed urban enforcement corps. He told police that the drink vendors had clashed with members of the chengguan who told the men their drink stands were blocking traffic and confiscated their merchandise. While the hoped-for payoff didn’t pan out, Han’s initial performance was convincing. He had more than 10 accomplices gather to carry away his corpse on a gurney, demanding tens of thousands of yuan (thousands of dollars) to compensate for the faked death. The plotters apparently had not considered one crucial detail. How would they make their claim without a corpse? By this point, the scene had attracted the attention of 80 police officers and 300 onlookers who gathered to protest his supposed killing by the chengguan. After suffering under a sheet for two hours, the man could no longer stand the sweltering conditions and leapt up to chug a bottle of water. Han and two others were detained for disturbing social order. 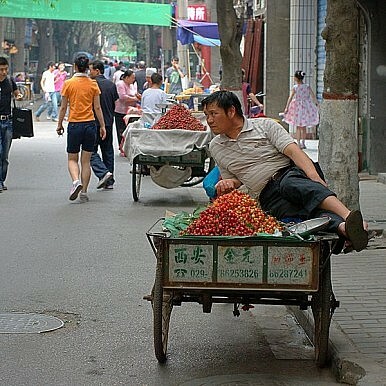 The chengguan has a history of brutality in their quest to crack down on illegal street vendors – the most recent being last month when some of the enforcers beat a watermelon seller to death in Hunan province. The rise and fall of Zhang Biqing’s rooftop villa tells us much about China’s elite.